Context: It has been hypothesized that diagonal earlobe crease (DELC), “Frank's sign” is indicative of coronary artery disease (CAD) and/or diabetes mellitus (DM). Several studies have confirmed an association between DELC and cardiac morbidity, mortality, and hypertension (HTN). However, some studies have not found any significant association. Aims: This study aims to find out the prevalence of DELC and its association with CAD, DM, and HTN. Settings and Design: Sangli-Miraj-Kupwad Corporation area. This was a cross-sectional analytical study. Subjects and Methods: Study participants: Adults from 18 to 60 years age. Inclusion criteria: willing to participate in the study Exclusion criteria: Wearing heavy ear rings and excessive normal generalized wrinkling of the skin. Sample size: Sample size 6310, determined after a pilot study revealing DELC in 1.5%. Sampling technique: Two-stage cluster sampling. Duration of study: 6 months. Study tools: Predesigned, pilot tested pro forma. Statistical Analysis: Statistical analysis was done by using SPSS 22 software. Prevalence and percentages were calculated, and Chi-square test was applied. Results: Out of 6638 participants, 179 had DELC. The prevalence of bilateral DELC was 2.7%. The prevalence was significantly high among males (4.13%) and in the 51–60 years age group (5.29%). The prevalence of Grade 3 DELC was high and 91% of young adults had Grade 3 DELC. There were 408 (6.15%) participants who gave a history of CAD, 827 (12.46%) of DM, and 670 (10.09%) HTN. 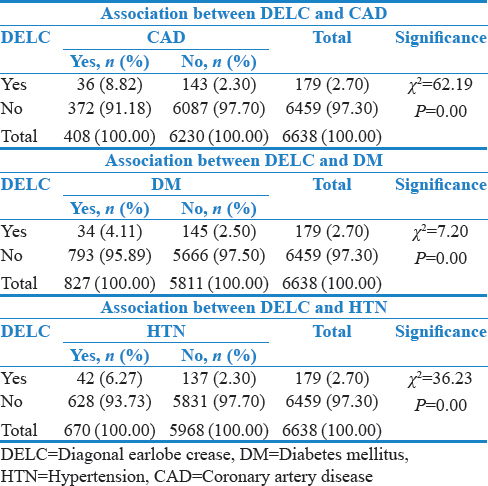 Significantly high association observed between DELC and CAD, DM, and HTN. CAD, DM, and HTN were significantly associated with Grade 3. Conclusions: The prevalence of bilateral DELC was 2.7% and is significantly associated with CAD, DM, and HTN. 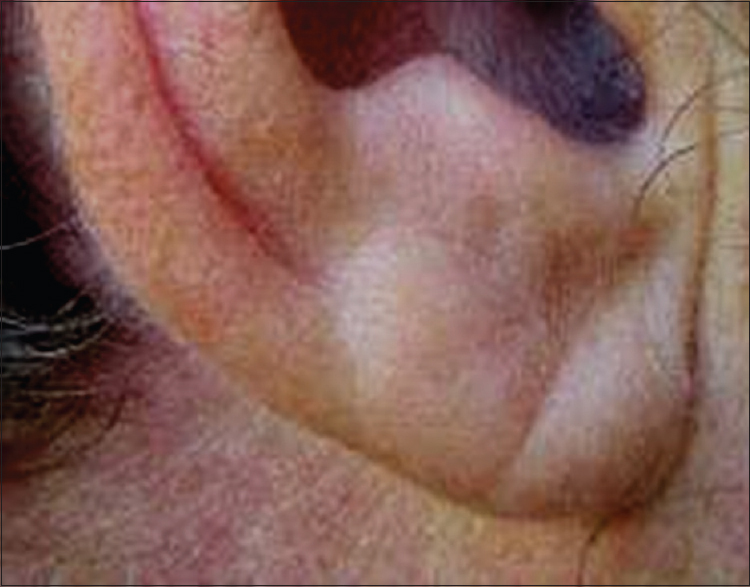 Bilateral diagonal earlobe crease (DELC), also called “Frank's sign,” was first reported to be associated with risk factors for coronary artery disease (CAD) by Frank. Several reports thereafter have confirmed an association between earlobe crease and CAD.,,,,,, It has been reported that DELC is associated with increased cardiac morbidity and mortality. An association between DELC and systolic hypertension (HTN) is also reported. However, some studies have not found any significant association between DELC and CAD. Agouridis et al. mention that even though it is evident that there is an association between DELC and CAD, there are some limitations to say so. The pathophysiological link between DELC and CAD can be explained as both the earlobe and heart are supplied by “end arteries” without the possibility for collateral circulation. 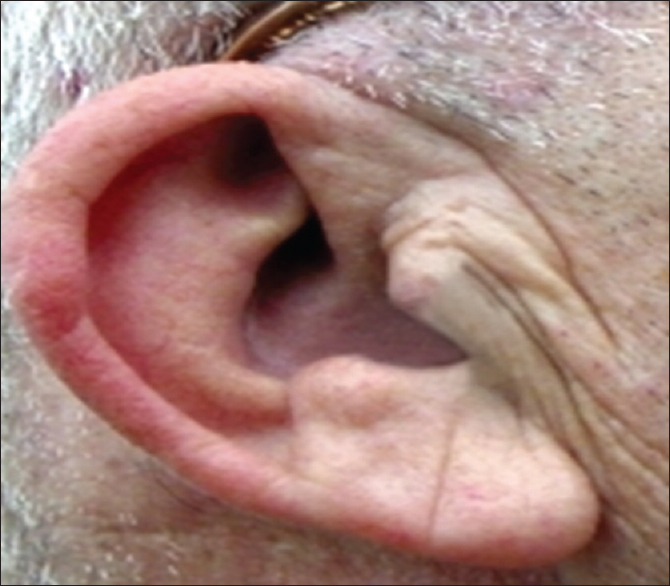 The microvascular disease results into loss of elastin and elastic fibers in the earlobe causing DELC. The presence of DELC may reflect the presence of a similar microvascular disease in the coronary circulation in the individual. Hence, DELC may be used as a sign for prediction of CAD. The prevalence of DELC in general population is not available as all available studies are hospital based. Indians as a community are more prone to CAD, Diabetes Mellitus (DM), and HTN and at a much younger age. Hence, this study was planned to find out the prevalence of DELC and its association in known patients with CAD, DM, and HTN. A cross-sectional study was conducted in Sangli-Miraj-Kupwad Corporation (SM and KC) area, Maharashtra, India. Study participants were adults of both sexes and with age ranging from 18 to 60 years. Study participants wearing heavy ear rings or with excessive generalized wrinkling of the skin were excluded. Sample size was calculated by using prevalence of DELC (1.5%) as obtained from a pilot study. Calculated sample size was 6310 (α = 5%, zα = 1.96, P = 1.5%, d = error 20%). Two-stage cluster sampling technique was used for selection of study participants. There are total 71 wards in SM and KC area. One ward from each area (Sangli, Miraj and Kupwad) was selected. House-to-house visit was paid to identify study participants. All participants willing to participate in the study were included till the desired sample size was achieved. All available and eligible participants from a house were included. A well-designed questionnaire as per the need of study was developed to collect and record the data of the participant. The questionnaire was pretested and used for pilot study also. Four interns were identified and were trained by investigator with the help of power point presentation for identification, grading of DELC, and for data collection by using the questionnaire. Trained interns were provided with the photograph of DELC to help them in explaining about the study to participants. The study participants were asked about history of three medical ailments – CAD, DM, and HTN, and the answer was recorded. The DELC is an earlobe crease extending diagonally from the tragus across the lobule to the rear edge of the auricle. In the study, the participant is diagnosed to have DELC only when the said crease is bilateral. 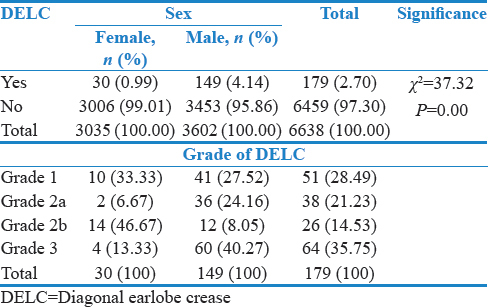 The severity of DELC is graded as follows: Grade 1: A small amount of wrinkling on the earlobe [Figure 1], Grade 2a: Creased more than halfway across the earlobe [Figure 2], Grade 2b: A superficial crease across the earlobe [Figure 3], and Grade 3: A deep crease across the whole of the earlobe [Figure 4]. Statistical analysis was done by using SPSS 22 software (IBM Corp, Armonk, New York, USA). Prevalence and percentages were calculated. Chi-square test was applied to find out the association between DELC and diseases, namely, CAD, DM, and HTN. Total participants interviewed during survey were 6638, out of which 3035 were females and 3602 were males. Age of the participants ranged from 18 to 70 years, mean age being 43.80 years standard deviation (SD) ±13.51. Out of 6638 individuals, 179 had bilateral DELC. Grade-wise distribution of DELC was as follows: Grade 1: 51 (28.49%), Grade 2a: 38 (21.23%), Grade 2b: 26 (14.53%), and Grade 3: 64 (35.75%). The prevalence of bilateral DELC was 2.7%. The prevalence of Bilateral DELC in males was 4.13% (149) and in females, it was 0.99% (30). The prevalence of DELC was significantly more common in males (χ =37.32, P = 0.00) [Table 1]. Mean age of participants without bilateral DELC was 43.52 years with SD ± 13.42. In contrast, mean age of persons with bilateral DELC was 53.43 years with SD ± 13.47 (z = 9.71, P = 0.00). The prevalence of bilateral DELC was significantly high in the 51–60 years age group (5.29%, χ2 = 94.73, P = 0.00). Interestingly, 91% of young adults of age between 18 and 35 years having DELC had DELC of Grade3 [Table 2]. History of CAD was present in 408 (6.15%) participants, history of DM in 827 (12.46%), and history of HTN in 670 (10.09%). Out of 179 persons with DELC, 36 (20.1%) had history of CAD (χ2 = 62.19, P = 0.00), 34 (19%) had DM (χ2 = 7.20, P = 0.00), and 42 (23.5%) had HTN (χ2 = 36.23, P = 0.00) [Table 3]. Maximum study participants with CAD had DELC of Grade 3 and 2a. DM was present mainly in participants with Grade 2b and Grade 3 DELC. Maximum study participants with HTN had Grade 3 DELC. Significant association was observed between grades of bilateral DELC and DM (χ2 = 38.43, P = 0.00) and HTN (χ2 = 16.18, P = 0.001). DELC has been suggested as a marker of generalized atherosclerosis. It has been already stated that both earlobes and heart are supplied by “end arteries” where possibility for development of collateral circulation is low. Histopathology studies of biopsies from earlobe in cases of DELC have reported loss of elastin fibers indicating a generalized microvascular disease and hinting at possibility of similar changes in coronary arteries in the affected individuals. Majority of clinical, angiographic, and postmortem study reports support the proposition that DELC may be associated with CAD and can be used as a valuable indicator which can be observed/identified easily clinically.,,,,,,, Ramos et al. 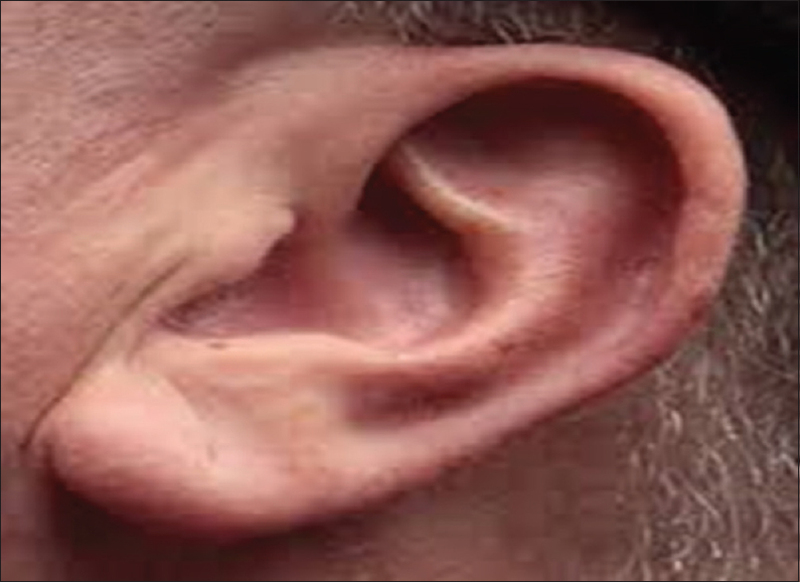 have studied and concluded that ear creases are independently associated with peripheral arterial disease and may be an external marker for risk identification. In addition, Kang and Kang found association between earlobe crease and the metabolic syndrome. Elliot and Karrison conducted a prospective cohort study and found a positive association between DELC and all cause morbidity and mortality including cardiac cause. In another study, Elliot and Powell found earlobe creases to be associated in a graded fashion, with a higher rate of cardiac events. In “a review of the medical literature and dental implications,” authors conclude that even though more research is needed in this area, it is advisable for a dentist to use DELC as a vital sign along with the medical history and other signs for risk assessment and medical evaluation. A positive association between DELC and CAD was observed in the present study. Most studies of “prevalence” of DELC are actually hospital-based studies while ours is a community-based study. The prevalence of DELC was found to be significantly higher in males. This finding of male preponderance is also noted by other studies, even though the studies were hospital based., It was observed that prevalence of DELC was mainly present in the older age and similar findings are noted by other investigators. DELC was also observed to be significantly associated with DM and HTN in our study. DM and HTN are independent risk factors for CAD, and patients with DM and HTN are vulnerable to atherosclerosis. This fact may explain a significant association between DELC, DM, and HTN. Telomeres shorten during the replication of somatic cells, leading to attrition in the length of telomere indicating progressing biological age. Telomere length in leukocytes reflects the cumulative burden of oxidative stress and inflammation in the circulation during an individual's lifetime and has been reported to be a useful marker of biological aging of the cardiovascular system. Atherosclerosis, essential HTN, and noninsulin-dependent DM are age-related disorders, and telomere length is one of a number of biologic indicators that may serve to assess the progression of biologic aging in humans. A study conducted on male Japanese patients with metabolic syndrome found association between DELC with a shorter telomere. Hence, the researchers concluded that DELC might be a useful indirect marker of high-risk patients. Pasternac and Sami concluded in their study that “the ear-crease sign” could identify patients who are aging earlier than usual and are thus at risk of CAD prematurely and whose prognosis might be improved by early preventive measures. In the present study, only self-reported cases of CAD, DM, and HTN were considered. Therefore, many of the undiagnosed cases may have been missed. In spite of this limitation, on the basis of statistical results and results reported by several other studies, we can say that there is an association between DELC with CAD, DM, and HTN. Considering the pathophysiology of DELC, DELC may be said to be the external presentation of atherosclerosis. This atherosclerosis could be because of aging or accentuated by DM and HTN leading to CAD. At present, the association between the time of onset of DELC and that of atherosclerosis is not known. Thus, considering all these aspects, we can conclude that whenever there is DELC, we should plan to evaluate the individual for CAD, DM, or HTN. The prevalence of bilateral DELC was 2.7% and was significantly associated with CAD, DM, and HTN. Therefore, bilateral DELC, a visual cutaneous clinical marker, can be used as a screening tool for early diagnosis and prevention of CAD and other related diseases. Miot HA, de Medeiros LM, de Siqueira CR, Cardoso LC, Gumieiro JH, Filho MA, et al. Association between coronary artery disease and the diagonal earlobe and preauricular creases in men. An Bras Dermatol 2006;81:29-33. Wu XL, Yang DY, Zhao YS, Chai WH, Jin ML. Diagonal earlobe crease and coronary artery disease in a Chinese population. BMC Cardiovasc Disord 2014;14:43. Mahdi M, Rashidi N, Maryam M, Maleki A, Mohmmad M, Mahmood M. Is diagonal earlobe crease a marker for coronary artery disease? Heart India [serial online] 2014;2:104-6. Available from: http://www.heartindia.net/text.asp?201/2/4/104/146614. [Last accessed on 2017 Mar 27]. Salamati P, Nazeri I, Alehossein M, Sotoudeh K, Rezaee A. Earlobe crease and coronary artery disease. Pak J Med Sci 2008;24:600-3. Fabijanic D, Miric D, Radic M. The diagonal ear-lobe crease. As sign of some diseases. Saudi Med J 2006;27:130. Earlobe Crease and Heart Disease; Fact or Myth? MyHeart. Available from: http://www.myheart.net/articles/earlobe-crease-and-heart-disease-fact-or-myth/. [Last accessed on 2015 Jan 05]. Elliott WJ, Karrison T. Increased all-cause and cardiac morbidity and mortality associated with the diagonal earlobe crease: A prospective cohort study. Am J Med 1991;91:247-54. Agouridis AP, Elisaf MS, Nair DR, Mikhailidis DP. 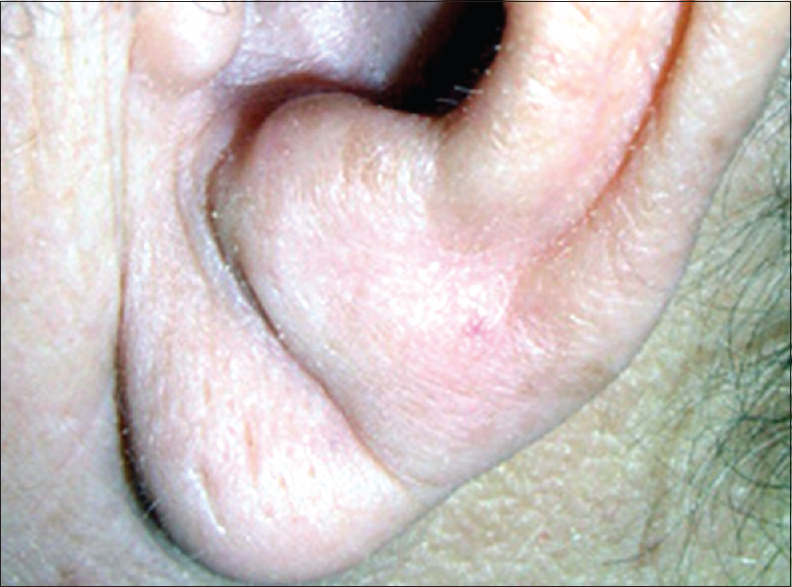 Ear lobe crease: A marker of coronary artery disease? Arch Med Sci 2015;11:1145-55. Evans K, Hing AV, Cunningham M. Craniofacial malformations. In: Gleason CA, Devaskar SU, editors. Avery's Diseases of the Newborn. 9th ed., Ch. 95. Philadelphia, PA: Elsevier Saunders; 2011. Qamar A, Ioannides KL, Khetarpal SA, Kiss D. Bilateral Earlobe Creases and Coronary Artery Disease. Available from: http://www.circ.ahajournals.org. [Last accessed on 2016 Nov 21]. Kuri M, Hayashi Y, Kagawa K, Takada K, Kamibayashi T, Mashimo T. Evaluation of diagonal earlobe crease as a marker of coronary artery disease: The use of this sign in pre-operative assessment. Anaesthesia 2001;56:1160-2. Hou X, Jiang Y, Wang N, Shen Y, Wang X, Zhong Y, et al. The combined effect of ear lobe crease and conventional risk factor in the diagnosis of angiographically diagnosed coronary artery disease and the short-term prognosis in patients who underwent coronary stents. Medicine (Baltimore) 2015;94:e815. Shrestha I, Ohtsuki T, Takahashi T, Nomura E, Kohriyama T, Matsumoto M. Diagonal ear-lobe crease is correlated with atherosclerotic changes in carotid arteries. Circ J 2009;73:1945-9. Kirkham N, Murrells T, Melcher DH, Morrison EA. Diagonal earlobe creases and fatal cardiovascular disease: A necropsy study. Br Heart J 1989;61:361-4. Ramos PM, Gumieiro JH, Miot HA. Association between ear creases and peripheral arterial disease. Clinics (Sao Paulo) 2010;65:1325-7. Kang EH, Kang HC. Association between earlobe crease and the metabolic syndrome in a cross-sectional study. Epidemiol Health 2012;34:e2012004. Elliott WJ, Powell LH. Diagonal earlobe creases and prognosis in patients with suspected coronary artery disease. Am J Med 1996;100:205-11. Friedlander AH, López-López J, Velasco-Ortega E. Diagonal ear lobe crease and atherosclerosis: A review of the medical literature and dental implications. Med Oral Patol Oral Cir Bucal 2012;17:e153-9. Higuchi Y, Maeda T, Guan JZ, Oyama J, Sugano M, Makino N. Diagonal earlobe crease are associated with shorter telomere in male Japanese patients with metabolic syndrome. Circ J 2009;73:274-9. Pasternac A, Sami M. Predictive value of the ear-crease sign in coronary artery disease. Can Med Assoc J 1982;126:645-9.